One of the most confusing things about playing certain slot machines is the “gamble feature” which is sometimes an option, so we thought it would be a good idea to discuss this feature, because it can benefit your bankroll greatly! Slot machines which can let you potentially increase your winnings (much like the double-or-nothing feature in video poker games) are virtually as old as the first land-based slot machines you could play at brick-and-mortar casinos. Slots with a gamble feature built into the game have spread rapidly throughout slot machine venues around the world. Online casino gaming software providers quickly caught onto the idea of introducing similar games at online casinos, much to the delight of online slots players that like to up the stakes. If you’re not familiar with the gamble feature found in slot machines, keep on reading this article to find out how to take advantage of it. How and When to Play the “Gamble Feature” in Slots? 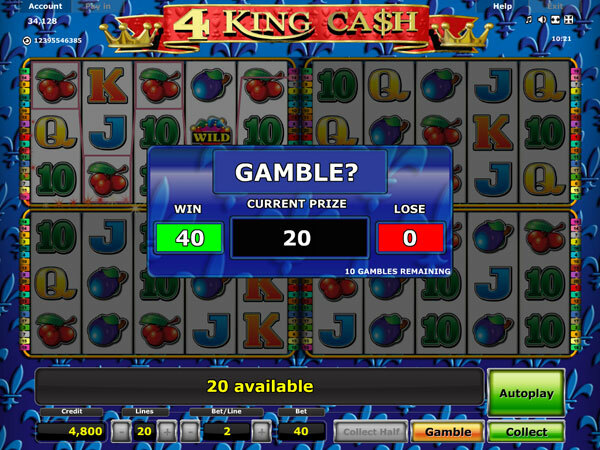 In the Gamble Feature bonus game, you have to select different combinations. It’s different depending on the slot machine, but it usually it pertains to a deck of cards, and you’ll need to choose between either red or black to double your winnings, or try and pick the correct suit to quadruple your winnings. You’ll have the option to gamble the original win after the credits are displayed in the base game. An attractive advantage for slots players that choose the “gamble feature” is that the odds against you are fixed. If for example you can choose from two options in a double-or-nothing gamble feature, either red or black, there’s a 50% chance of winning. It is advisable that you opt to choose the gamble feature at least a few times during a playing session to really get the amount of money you have to gamble with going in the right direction. Two video slot machines that offer a gamble feature option include the Thunderstruck and Spring Break slot games, which can be played at Microgaming-powered online casinos advertised on this site. Of course, the gamble feature was first introduced on land-based slot machines and quickly found their way to online casino websites. Both are 5-reel video slots with 9 pay lines and a max bet of 45 coins. If you hit the bonus round, there are 15 free games to be won and you can re-activate these free spins bonus games an unlimited number of times. The Thunderstruck 2 slot also has the gamble feature to add a lot more excitement to what is already an excellent slot game. Fortunately, as well, there are mobile versions of these Gamble Feature Slots, so mobile slots players also get to play these games. To clarify just how much you could potentially win when choosing the gamble feature option when playing particular slots, let’s consider the Microgaming Thunderstruck video slot. The game has a top jackpot of 10,000 coins, with a second highest prize of 2,000 coins. You’re unlikely to hit either of the combinations required for these payouts, but you could grab some of the many smaller 50 and 100-coin prizes being offered to you. Let’s say you won 100 coins and decided to gamble the win. Here you might gamble your small 100 coin win and turn it into a nice 1,600 coin win if you were to succeed twice in quadrupling your original bonus game winnings! You can quickly begin to see the enormous upside of playing slot machines that come with the gamble feature built into them. It is also common to find these types of slots at Playtech online casinos. One of the most popular Playtech powered gamble feature slots is the Gladiator Jackpot slot which comes with 5-reels and 25 active pay lines. These types of slot games, with their “gamble feature”, offer a handy way to increase your winnings without the need to hit a massive jackpot! All of the smaller wins really add up over the course of a slot machine session. It also offers an additional exciting element to the game that gamblers will certainly appreciate. You should be given the option to increase your winnings if you feel like gambling your money. Also, keep in mind that when you’re playing slot machines with a Gamble Feature, you are not forced into picking this in-game option should you not feel like risking a win to double or quadruple your winnings. But really, it must be said, if you’re not looking to gamble and win a lot of money, why are you playing to begin with? Slots with a gamble feature are the latest craze at online casinos – make sure you take full advantage of this generous feature.